You can see from the picture how 'fall gardening' (autumn in U.K.) can produce a pretty scene for small gardens. But there's usually a heap of jobs with leaves galore. Check out on this link how to make the clearing up part of your gardening that bit easier to do. Gardening jobs to-do are itemised on this link. Don't forget that Fall Gardening plans will include: Thanks Giving Day, Harvest Festival, and in the U.K. Halloween, Duck Apple and Bonfire Night. see here. Fall gardening with mushrooms brings a rewarding harvest. U.K. gardeners grow an interesting range from mushroom growing kits to fresh logs containing the sporn inoculated dowels are available... The most delicious of mushrooms are also available on the above links, include: several types of prized Truffle fungi supplied with Birch tree - a cost effective means to an expensive delicacy. American gardeners I'll be bringing mushroom growing kits back to the home of the organic gardener soon. I'm very glad to see these interesting plants in cultivation. I do look forward to them during my early spring and fall gardening activities. Lawns: Scarify & aerate lawn, & rake in autumn feed, or sand if badly drained - Prepare soil & sow new lawns - Lay turf lawns - Apply leafy compost mulch on small areas for spring grass sowing. more on lawn care. Secure: Cut out dead, diseased or broken wood, secure fruit branches - Tie in loose branches. more on pruning here. Plant/Transplant: While soil unfrozen plant trees, shrubs, new perennials & biennials, transplant spring vegetables - all with plenty of garden compost. more on moving shrubs here. See The Organic Gardener's Diary Blog. Fall gardening is, of course, a prelude to winter. A cold chill reminds us of the inclement days to come. You will inevitably think about wearing warm clothes, gloves, hotties, and protective clothes like over-shoes. Breathable & waterproof gear is an asset for comfort and protection. 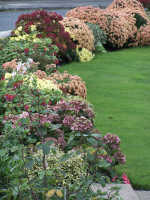 Check out on this link how to make the clearing up part of fall gardening that bit easier to do. You can turn all those fall leaves into a valuable seed and potting compost - How to make leaf mold & use it. Gather together > move the pile - shred & move the pile > recycle - dispose > make leaf mold and garden compost. Find tools and methods to clear up fall leaves easily here. For lawn-clearance rakes with curved tines are best because they lift leaves and hedge cuttings off the grass without damaging it. My page on rakes details the advantages of a whole range of different rakes fit for purpose. Find a suitable rake here. adjustable rakes are more versatile than the conventional spring rake. You can alter the spread of the tines for working in tight spaces between shrubs, or to gather a large pile on the lawn for example. Reducing the spread a little can make raking more effective. They also store better with the tines folded up. These 2 links both go to highly versatile interchangeable tool heads and job by job specialised rakes are described here.